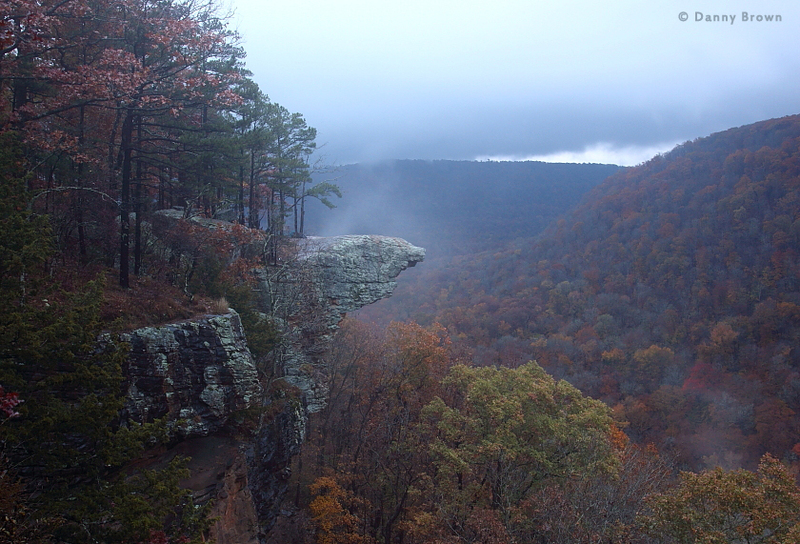 Hawksbill Crag at dawn in a light rain. The alarm woke us up early to a light rain that had followed storms throughout the evening in Harrison. “Up and at em; it’s three o’clock,” I said to Bill. As we got ready, we rationalized that it was really four o’clock because the time had changed during the night. Either way it was too early for anybody in their right mind to be checking out of a motel. By 3:20 the friendly southern desk clerk had us checked out and coffee’d up. We loaded the 4Runner and headed toward Ponca where we would eventually get on a gravel road that went straight up a hill with no switchbacks for 5.4 miles to yet another church that served as a marker that we were close to the trailhead of Arkansas’ iconic Hawksbill Crag. It rained during the entire drive to the trailhead but it seemed to be tapering off as the minutes went by. I was actually excited about the light rain because I knew it would bring interesting possibilities to the sunrise images I was planning. When we pulled into the parking lot it was pitch black, so dark we couldn’t see anything so the first order of business was to get our headlamps on. Next I gathered my gear and caught up with Bill, who was already starting down the 1.5 mile trail like he had been on it a hundred times. We crossed several creeks along the trail which closely flanks the Buffalo River bluffs, and we later learned from campers that it had stormed all night. At the third crossing, we found a nice waterfall going over a ledge that was right next to the trail. It was starting to get so foggy, we could barely see but we could just sense that we were getting close to the crag. It was still dark when the valley began to open up in front of us and we crept over to the edge of the bluff to see what we could see in the dark. 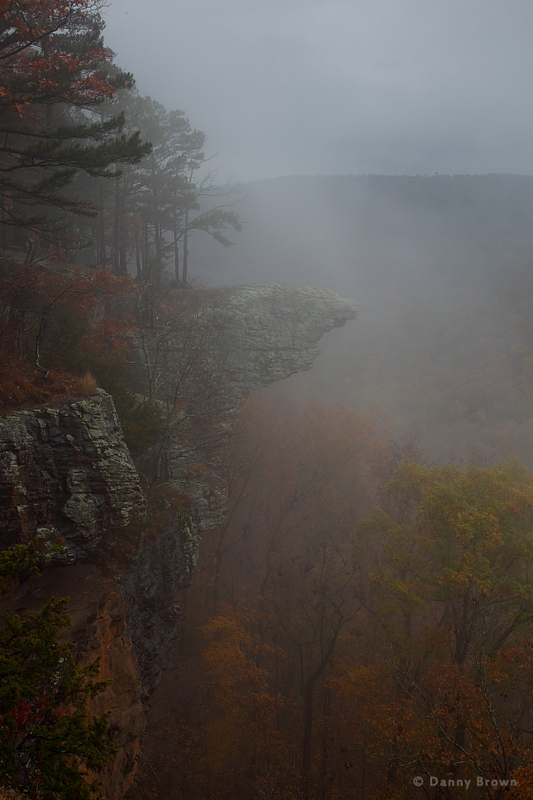 There it was — the outline of Hawksbill Crag in the foggy darkness. I must say it was a pretty overwhelming feeling to see the geological wonder that I’d been thinking about for so many years. No tears or anything like that, but some pretty strong emotions. As we approached the crag, we found another outcropping that was obviously photography central. I knew I was following many before me who had used that spot to capture brilliant images of the crag. I felt a little intimidated but shook it off and began setting up my equipment. It was a good 30 minutes before it became light enough to make the featured image in a very light rain. The shutter speed was probably about 30 seconds at ISO 100. Bill and I were both jubilant that the sky was so interesting. On another day it might have been uniform and almost white at that hour. Later as the gloom turned into more of a glow, we met another hiker, Josiah, who had heard us getting ready and decided it must be time to start down the trail for some photos. He had been sleeping in his truck and said he wasn’t sure when to start but knew we were going for photos so headed out behind us. Josiah spent the rest of the morning with us and we enjoyed sharing stories about our lives and the wonders of Arkansas’ natural world. 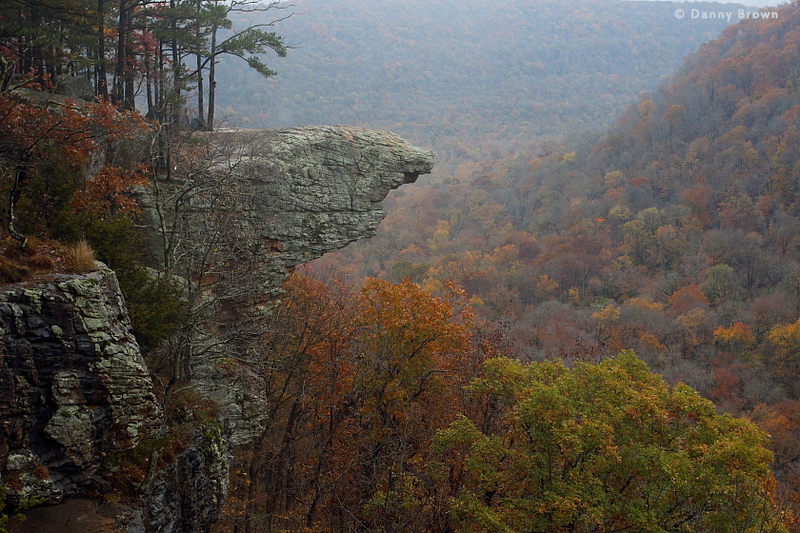 About an hour after our arrival the light began to bring out the color of the Buffalo River valley, including the trees under the crag. People were already beginning to show up and walk out on the crag so I had to shoot fast during moments when the crag was all clear. This was a little difficult because I was still shooting rather long exposures. The image below was taken during some of the finest light of the morning. 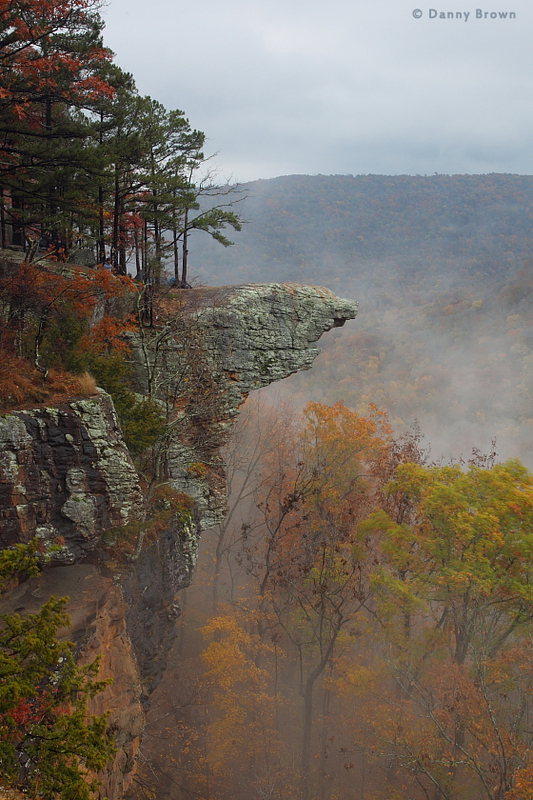 A painterly vision of Hawksbill Crag on a foggy autumn morning. Throughout the morning, we saw up to 10 or 12 people out on the crag at a time, enjoying the morning. Josiah had seen 40 out on the rock the night before! Some went farther out than others; they each had their own level of confidence which was none of my business. We even watched a young kid doing handstands! The coolest part of the morning was when a couple went out on the crag and the young man knelt and proposed to his girlfriend. I captured the entire series from my location down the bluff, including the “yes” and the afterward kiss, and the couple was elated when I offered to send them a CD with all of the high-res images. Oh how nice it always feels to make others feel good! Every once in a while the fog would roll in and change the mood of the entire area. I just kept snapping away, trying to document it all. The image below was actually taken “after” the above image. Occasionally fog would roll in, totally unexpected and bath the area with gloom. I loved it! By mid-morning, the iconic crag was crawling with people so I knew it was time to head home. Besides, Bill and I wanted to look for the waterfalls that we had heard on the way in through the darkness. Josiah joined us on our return adventure and we worked our way back to the truck. One of the last images I made before we said goodbye to Hawksbill Crag. By the time we had our gear loaded, our stomachs were growling pretty good. Another young man, Stephan, who was traveling with the couple who became engaged on the crag, recommended the Ozark Diner in Jasper. We met the three of them when we arrived and Bill and I feasted on eggs, biscuits, hash browns, gravy, a pancake or two and a few other things I might be forgetting. There was an acoustic guitar that looked lonely on the stage right behind our table so after obtaining permission, I sat on the stage and played some “Whiskey Before Breakfast” while waiting for my own breakfast. I even saw some heads bobbing to the beat out in the diner. Fun times! After breakfast I began the four-hour drive home while Bill reviewed the weekend’s images on the LCD of my well-worn and beaten up Mark IV. Oh that camera has been through so much, I dread the day when I might have to make friends with a new one. We made it home by mid-afternoon and it felt oh-so-good to sleep in my own bed that night. After some rest, I couldn’t stop thinking about my next trip to “The Waterfall State,” and the second best part of that experience will be sharing the images with all of you. Note to photographers: In case you are wondering, I used a tripod-mounted Canon 1D Mark IV with a Canon 17-40/4 L lens with a circular polarizer and a three-stop split neutral density filter. America is beautiful. I vote to keep it that way!